Sean G. says his 80-hour Zelda: Breath of the Wild save file no longer exists, along with the other contents of his Nintendo Switch, after the system's recent 5.0 firmware update met his Nyko portable docking kit. Sean had been using the popular third-party hardware for months before the update, which went live on March 12. 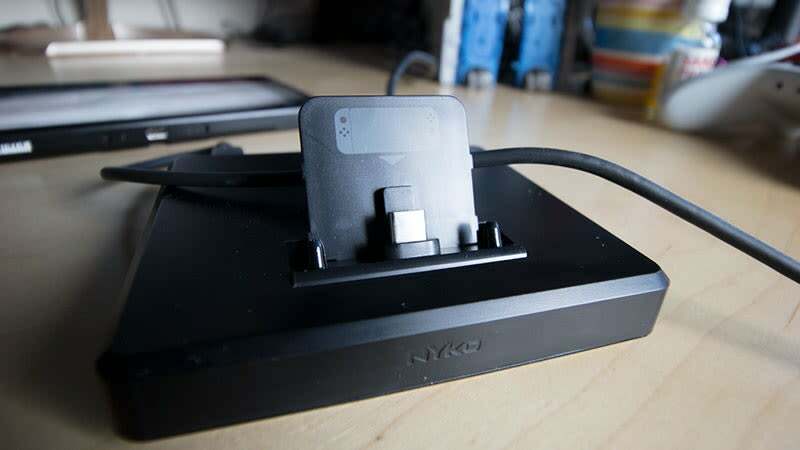 The Nyko kit is a handy, cheaper alternative to Nintendo's official $US90 ($116) dock. Unlike that official dock, it lets Switch owners look at their consoles' screens while it charges and packs up really small. In October, when the Nyko dock first came out, Kotaku's Mike Fahey reported that, while it also contains everything needed to connect a Switch to a television, "several visitors to the Switch Reddit have warned that the dock has busted the USB-C port on their consoles, rendering them unable to charge." (In an AMA, a Nyko rep responded that they were only aware of one instance of this). Now, Nyko Switch dock users are reporting another problem: bricked Switches. Sean says he's been using the dock since last October, but it wasn't until he updated his Switch to the 5.0 firmware that the console started bugging out. After receiving several error messages, Sean says his Switch stopped turning on at all. On Reddit and Nintendo forums, some third-party Switch dock owners are warning each other of bricked Switches after the recent update. It's not just Nyko. Some report problems with the FastSnail docking kit. Others report having no problems with the Insignia dock. Over email, Sean told Kotaku that he spoke with a Nintendo representative. "Apparently, Nintendo is aware of this issue," he said of the call, "and it is related to their updated 5.0 this weekend being pushed to devices and the use of Nyko Portable Docking kit. Nintendo has received multiple calls about the devices being completely bricked and is offering to repair the device if it is under warranty which thankfully mine was," adding that a Nintendo representative told him that recovering his data would be unlikely. Reached by email, a Nyko representative told Kotaku that the company is "aware of the issue some Portable Docking Kit owners are facing after updating the firmware on their Nintendo Switch to version 5.0. Though further testing is still required to determine the exact root cause of the problem, we believe it is related to the way the Switch handles AV output for an external TV/monitor while the console is docked on the Portable Docking Kit." Nyko says it is working on a solution and has policies on replacing malfunctioning products. Nintendo did not respond to a request for comment by press time, but last night, rolled out another firmware update that offers "General system stability improvements to enhance the user's experience." Nyko says it is taking a look at the update to see what exactly it does. In the meantime, Nintendo has issued a statement to Kotaku recommending that Switch owners only buy officially licensed Switch products, adding: "Unlicensed products and accessories do not undergo Nintendo's testing and evaluation process." "They might not work at all with our game systems, and they could have compatibility problems with certain games, the Nintendo Switch system itself, and other licensed accessories and peripherals." I feel a lot better for advising my friends to avoid 3rd party docks now. is the dock in question a Nintendo sanctioned dock? No. "Oh Nintendo" is wrong. This has very little to do with Nintendo, it's not their responsibility to ensure every piece of 3rd party hardware is compatible with their system. This is really on Nyko and the individual consumer. Caveat emptor. So it’s Nyko and the customers job to make sure NINTENDO won’t release an update down the line that causes switches to brick for simply using a dock that isn’t absurdly expensive, it’s Nintendo’s job to fix the update that is causing 3rd party peripherals to brick switches. First of all, the bricking of Switches has not been linked to an update. It seems to be being caused by an irregular USB-C port on the Switch itself, and when a non-Nintendo port is used it has the capacity to overcharge and brick the Switch. In this regard, it is Nyko's responsibility to do more research into the hardware it's supporting. But more importantly, it is indeed the customer's responsibility to be aware that using 3rd party accessory for ANY electronics is potentially hazardous. When you use a 3rd party device, you had better be damn sure you trust the company that made it, because any fault created by that device has the potential to void the warranty. Customers felt they could trust Nyko. I appreciate that. But ultimately, making the decision to use a new peripheral for a new device that was largely untested in a broader marketplace was a roll of the dice. And as a result, they lost. Yes, the customer is to blame. Yes, Nyko is to blame. No, it is not Nintendo's job to support 3rd party devices. Caveat emptor. Yeah, there have been warning on the Switch subreddit about this every few weeks. Someone tests their luck and ends up with a bricked Switch. wait.. can't users back up their data to usb/sd or their nintendo accounts? Nintendo haven't provided an option for this yet. Many people are hoping they implement something soon like cloud-saves. Not the first time Nyko accessories bricking consoles. It used to melt the usb of consoles before. i heard this was because nintendo didn't follow usb standards correctly, is that true? I heard it was the other way around and the third parties weren’t strictly following USB Standard. There's articles out there with tests showing the switch does not conform to usb c standards now. Never buy 3rd party peripherals & accessories. They are cheaper for a reason. I thought the Switch shipped with a dock in the box? Plus the Switch only ships with one dock, and this is much cheaper if you wanted an alternative for a second screen in your house rather than having to move the entire thing every time (plus since this one acts as a charging stand as well it's one that you could take with you to LANs and such while leaving your "primary" one/power pack set up at home).